Do you want a beach escape within striking distance of Lisbon? Then Costa da Caparica is a perfect destination for you! But where exactly is Costa da Caparica and how do you get there? What’s the weather like and where can I stay? So many questions, let me tell you all about it because I really enjoy this coastal area and have some good tips for you. Where is Costa da Caparica? Costa da Caparica is the town located in the municipality of Almada along the western coast of Setúbal district. Is it just a simple town? It’s also a stunning 30 km (19 miles) long coastline of sandy beaches that look out onto the powerful Atlantic. The route from Lisbon takes around 25 minutes by car, it crosses the Tagus River (“Tejo”) via the 25 of April bridge (“Ponte 25 de Abril”). It’s about 17 km (11 miles) from Lisbon. How to get to Costa da Caparica? If you have a car then there is no problem, well, as long as not everyone tries to get out of Lisbon to the beach at the same time, because then you can spend a few hours in a traffic jam. But it’s the easiest way to get to the Costa da Caparica. By car, it should take around 25 minutes. If you don’t have a car, don’t worry, as there is public transport that can take you to the beach on a warm and sunny day. You can choose between the direct bus that departs from Areeiro in Lisbon and terminates at the bus station in Costa da Caparica or take a ferry from Cais do Sodré to Cacilhas and then change for a bus to Costa da Caparica. The direct bus from Lisbon (Praça do Areeiro) to Costa da Caparica is the 161 service operated by Transportes Sul do Tejo (TST by Arriva). A single ticket costs €3.20 and is purchased from the driver. Unfortunately, TST doesn’t use the Viva Viagem (Lisbon transit card) system. The journey takes between 40 minutes to an hour depending on the traffic in Lisbon and terminates at Costa da Caparica bus station, which is located 500 metres (1,640 feet) from the beach and 1 km (0,6 miles) south of the main resort centre. The ferry departs from Cais do Sodré (the final station on the green Metro line) to Cacilhas across the Tagus River. 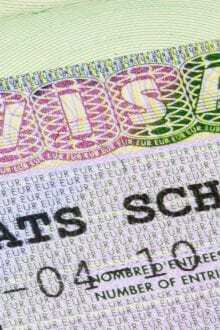 Ferry ticket cost €1.25 and is charged to the Viva Viagem reusable public transport card. Then you can choose between the express bus service from Cacilhas to Costa da Caparica, the TST 135 bus service (20 minutes route) or the slower TST 124 (40 minutes route). The bus ticket is €2.40 and is purchased from the driver. As you can see, both routes cost almost the same, but my recommendation is the ferry route may be more convenient for tourists, who are based in downtown Lisbon. There is one other option. You can board a shuttle service in central Lisbon at Praça da Figueira and head to the beach any day, any time. Our friends at Get Your Guide will even store your luggage for you while you are at the beach. This is a great deal. For only €5 per person, this is the cheapest way to get to the beach in comfort. Book your tickets here. When’s the best time to visit Costa da Caparica? Well, if you want to calmly enjoy your time I suggest you visit Costa da Caparica in the low season, which is from April to May and September to half of October. 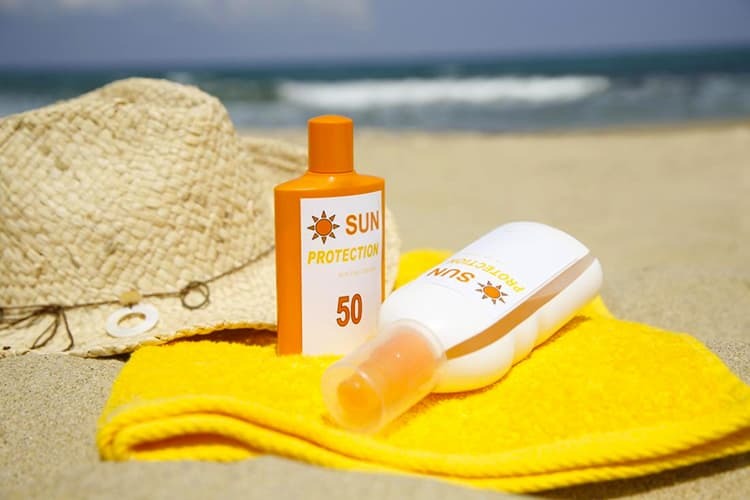 During the low season, the majority of the days are bright and sunny, but temperatures are not generally warm enough for relaxing on the beach. But if you’re like me, you love the sun and hot weather so I definitely recommend you to go there during the summer (June to August). Costa da Caparica is a lively and enjoyable resort town that is popular with the Portuguese, so it can be difficult to get to the beach, restaurant or park a car there, but when you’re waiting for a day off, lying on the beach with your favourite music and a glass of sangria in your hand, it doesn’t matter, right? The worse time to visit Costa da Caparica will be during the off-season (mid-October until March) as it will be very quiet and empty and most tourist facilities around will be shut. It’s also too cold to swim. What is the weather like in Costa da Caparica? These are the average temperatures in Costa da Caparica throughout the year. The most crowded beach is by Caparica town, so if you are searching for seclusion, you should move further south along the coastline to the best Costa da Caparica beaches which are Praia Morena and Praia da Sereia right next to each other. These beaches are surrounded by dunes and with good bars. Praia da Morena is well known by young people, mostly because it has a nice restaurant called Borda d’Água (website is in Portuguese) where you can stay until late and enjoy the sunset. While Praia da Sereia will be an alternative for the water sports fan. Costa da Caparica is a popular surfing spot as there are constant, but not massive waves. So if you would like to try surfing or you’re already intermediate surfing enthusiast it’s a great place for you. Hiring surf equipment at Costa da Caparica would cost you around €15 for a half day or €25 for a full day. Are you brave enough to try surfing for the first time in your life? So check out surf schools: Time to Surf and Caparica Evolution Surf School. If you’re a pro surfer and looking for something more check out 20 Best places to go surfing in Portugal. Do you want to try something easier? How about bodyboarding? It’s so much fun. 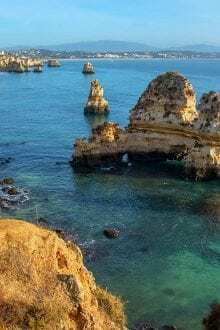 With this great deal from Get Your Guide, they will pick you up in Lisbon, take you to the beach, give you bodyboarding lessons for the day and take you to the beautiful Arriba Fóssil cliffs. Souvenir photos and video footage. 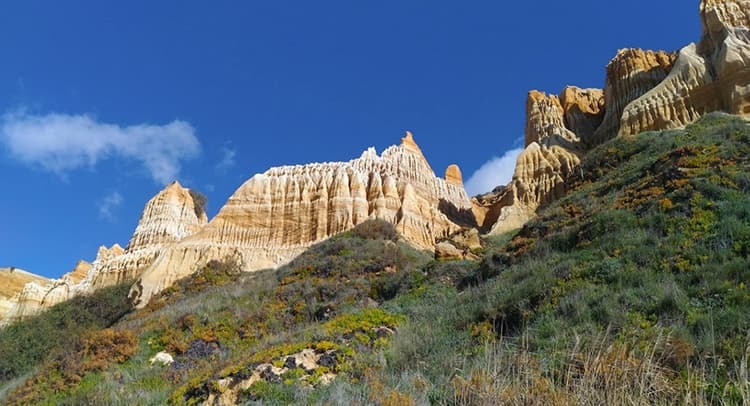 Further south you’ll find Praia Fonte da Telha beach embedded in the protected area of Arriba Fóssil and is walled by a continuous stretch of golden cliffs, topped with pine and eucalyptus trees. This beach is popular for more advanced water sports, like kite surfing and windsurfing. An interesting fact for you can be that there is an official beach for nudists in Portugal at Praia do Meco which is located 30 km (19 miles) to the south of Fonte da Telha. It can be difficult to reach the beaches that I mentioned here from Lisbon by public transport as you’ll have to change buses a few times. So I guess it’ll be much easier to rent a car even for one day. There is a mini train that runs from June through to September that will take you from one beach to another but watch out as the ticket prices can be a bit high. A return ticket starts at €5. So, when you add that up between a few of you, you may be better off taking a taxi or hiring a car for the day. You can find out more about car rentals here. 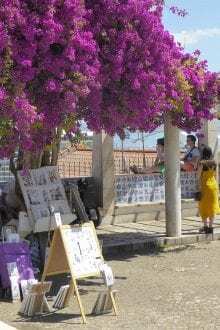 The only good connection is at Fonte da Telha, where you can go by ferry to Cacilhas and then take the bus from TST, number 127 or 145 directly to the beach. Not everyone is a beach person, so if you like sightseeing, Costa da Caparica has something to offer you too. Let’s explore the best things to do in Costa da Caparica and around the area. This is the place that you definitely can’t miss in this region because it’s a breathtaking natural treasure. The entire foreshore is a natural park, with stone pines, mastic trees and a eucalyptus forest. The Capuchos Convent (website is in Portuguese) was built in the 16th century and belonged to the Order of St. Francis. Franciscan friars lived here until 1759, exactly up to the 13 January when they were murdered after being accused of plotting the death of the King D. Jose I of Portugal. Today the convent belongs to the city of Almada and it’s used for exhibitions and cultural shows like concerts and music recitals. A bit further on you can admire Capuchos viewpoint from where you can see Costa da Caparica, but also the Lisbon skyline or even Serra da Arrábida Natural Park and Cabo Espichel. Solar dos Zagallos (website is in Portuguese) is an 18th century mansion which was bought by the municipality and turned into a cultural centre with gardens that are open to the tourists during the day (10 am to midday and 2 pm to 5.30 pm). 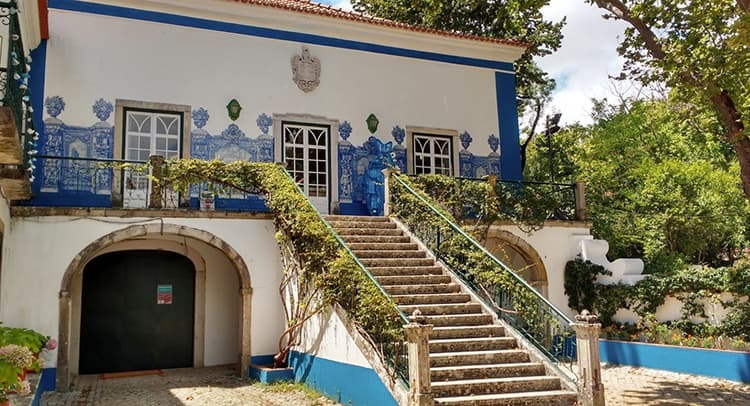 It’s recommended to stay there around two or three hours and enjoy the garden, the greenhouse, pavilions and blue and white tile panels (“azulejos” in Portuguese). The Cristo Rei is a sanctuary and a religious monument that represents the Sacred-Heart of Jesus, located in Almada municipality, 9 km (6 miles) from Costa da Caparica. As you can easily notice, it is inspired by Rio de Janeiro’s Christ the Redeemer (“Cristo Redentor”). The construction was inaugurated in 1959 and is 110 metres (360 feet) high. The views are amazing, you can climb up until 75 metres (246 feet) and get a glimpse of beautiful monuments of Lisbon, as well as take some nice photos of the 25 April bridge (“Ponte 25 de Abril”). The ticket for an adult costs €6 and for a child it is €3. When you’re visiting Almada, you can take the opportunity to see Fragata D. Fernando II e Glóri, the last ship in the Portuguese navy that used sails, which was launched in 1843. Nowadays the ship is located in Cacilhas. The riverside in Almada is dominated by a cliff. To make this place more interesting for tourists there are some attractions that were created. One of them is the Boca do Vento Elevator, which was opened in 2,000. When you get to the top, there’s a cafe with amazing views of the 25 April bridge (“Ponte 25 de Abril”) and Lisbon’s skyline. 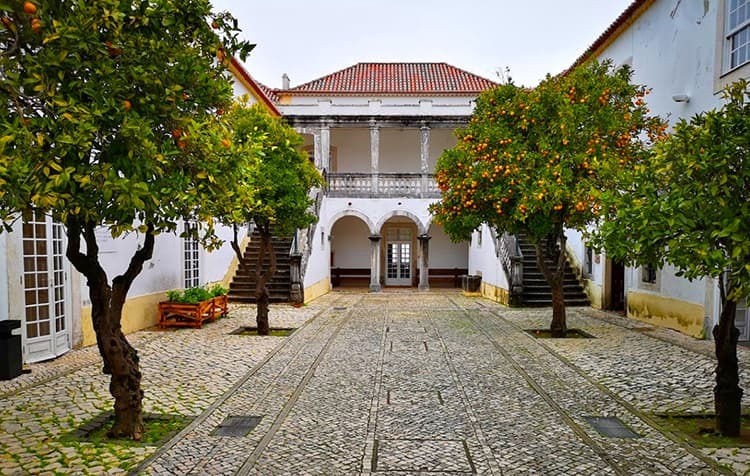 Casa da Cerca (website is in Portuguese) is a typical manor house from the 17th and 18th centuries that was converted into a contemporary arts centre in 1993. They are open from 10am until 6pm every day except Mondays. If you already know how to get to Costa da Caparica and what do to there, let’s check the top 5 places where you can stay. 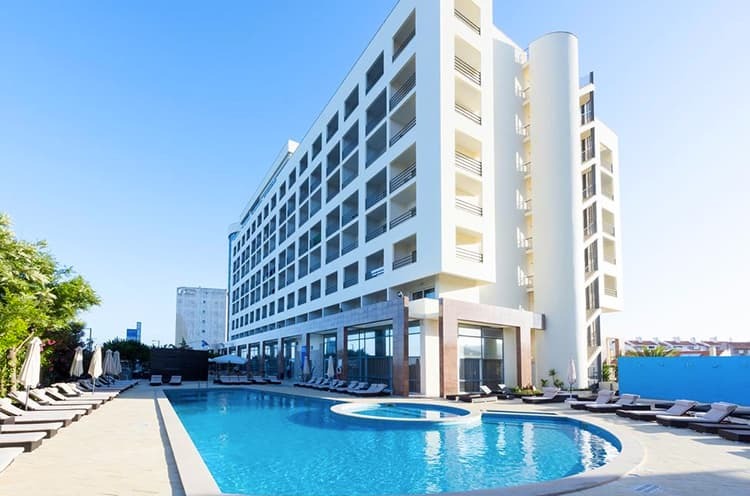 TRYP Lisboa Caparica Mar Hotel is situated on the seafront, at Avenida General Humberto Delgado 47. This hotel has rooms equipped with air conditioning and satellite TV, with private balconies that offer views of the hill or over the Atlantic Ocean. You’ll also have at your disposal a swimming pool and two restaurants. It costs €61 per night. Residencial Mar e Sol is situated in the centre of the town at Rua dos Pescadores 42, just 10-minutes walk to the beach. Rooms are big with air conditioning and satellite TV. The hotel has very good reviews about customer service and cleanliness. It costs €43 per night with breakfast included. Aldeia dos Capuchos Golf & Spa is located in the historic town of Vila dos Capuchos, on the Costa da Caparica, 3 km (2 miles) from the beaches. The hotel has a fitness centre with a gym and spa. The price is €80 per night. Hotel Residencial Colibri is located at the Avenida 10 de Maio which is only 10-minutes walk to the beach. Besides rooms with air conditioning, it offers a golf course and laundry service. The cost per night is €43. It’s a campsite situated 15-minutes walk to the nearest beach. Parque de Campismo Orbitur Costa da Caparica includes a tennis court and restaurant. All bungalows and caravans come with a kitchenette, private bathroom with showers and free parking. The simply furnished accommodation includes heating and a seating area with a TV. The price depends on what you want to book. For example, the price for two adults with a camper van is around €30per night. 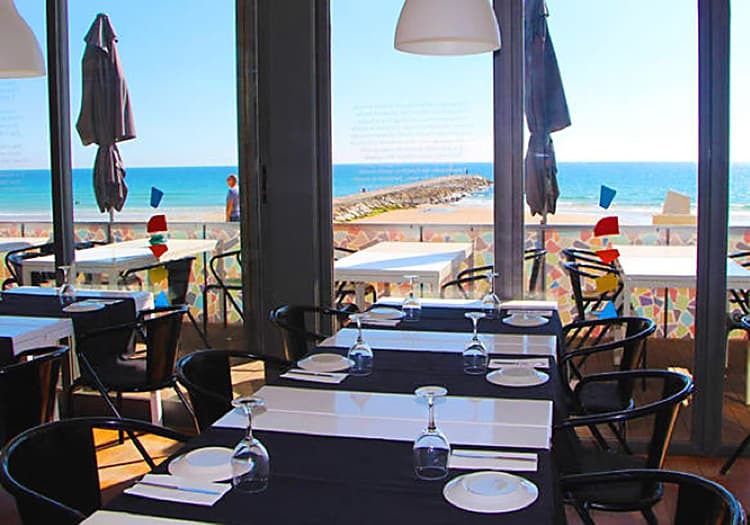 I would like to recommend to you some of the best restaurants in Costa da Caparica according where you can eat and drink, from the traditional Portuguese kitchen through to Japanese, Indian, vegetarian, vegan or gluten-free, so you can find the perfect place for you. Probably the best place to eat at the Costa da Caparica is O Mercado. It has excellent reviews and offers Portuguese cuisines, but also vegetarian, vegan and gluten-free meals. The price is around €30 for a dinner for two. Address: Avenida 1 de Maio. Open for lunch and then again for dinner except for Sundays and Mondays. Sentido do Mar is the place known for its sushi. It offers also other Japanese meals and seafood. The great view and a nice atmosphere are other additional assets to visit this place while being in Costa da Caparica. Address: Rua Muralha da Praia, Apoio 7, Praia do Norte 278. Open every day for lunch and then again for dinner. If you’re looking for an alternative from fish restaurants then the Indian Grill House is a good place to visit. The prices are reasonable, up to €15 per person. They offer excellent grilled dishes of meat and fish and also specialise in vegetarian, vegan and gluten-free meals. Address: Rua Jose Alves Martins 11. Everything for everyone. Ahoy Coffee & Bar is cheap and a nice place, where you can have a quick lunch or sit for a while and enjoy delicious dessert and coffee or drink sangria or regional beer that is served. Address: Avenida General Humberto Delgado 27. Open from 12 pm – 7 am except Wednesdays and Thursdays. Discover Portugal’s most famous dishes by reading: Typical Portuguese Food. 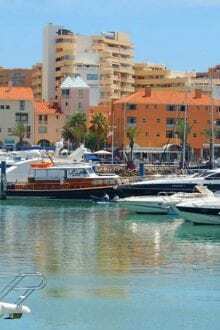 Is Costa da Caparica a good place to visit? Is it worth it? In my opinion, YES, it’s definitely a good place to visit and it’s worth it, especially if you stay in Lisbon. I guess all Europeans and non-Europeans from cold countries are looking for places like that, with amazing views, nice beaches and a great atmosphere, especially during holidays, where we want to rest, relax and get some sun. 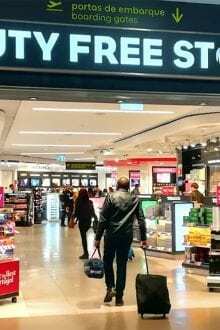 I would like to advise you to try to go there during the week, if possible, as during the weekend it can be very crowded because, as I mentioned above, all the locals are going there. First of all, think about what you would like to do there. Stay at the beach, go surfing, sightsee, etc. That’s the first step that all travellers should take. If you would like to just stay at the beach, it’s simple. 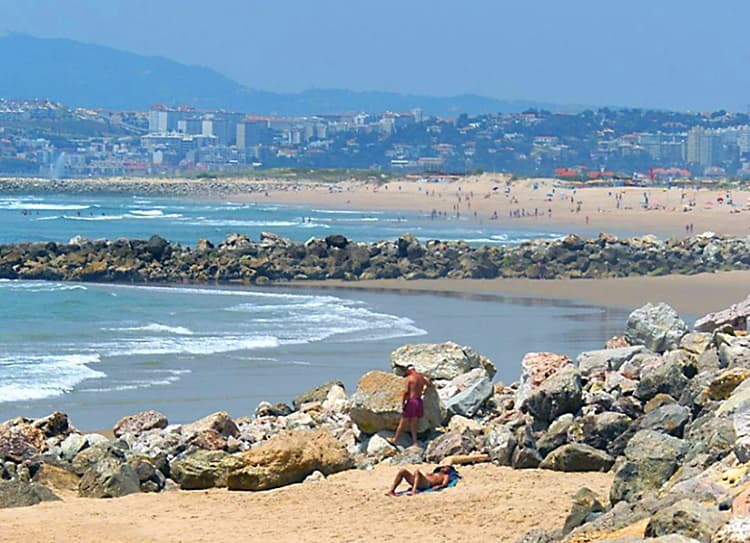 Check the ferry and the bus to the Costa da Caparica for both ways and pack the necessities for a beach day. Don’t forget sunscreen with a high sunblock filter if you don’t want to look like a roasted pepper. Seriously, I’m not joking. It happened to me once when I was at the beach, even though I had sunscreen, the filter was too low. So please, don’t make the same mistake I did. Being in Portugal is a perfect place for surfing, and if you don’t try it, it’s a shame! So if you’re intermediate or pro surfer, you already know that Costa da Caparica is a great place to surf. If you’re a beginner, don’t worry. Check the surf schools that I recommended above and stay open minded for new adventures. It’s going to be fun for sure! If you would like to just sightsee or divide your day into beach and sightseeing, I suggest that you rent a car, as it’ll be much easier to travel around, so you could enjoy your day with no worries. And of course, make a list of places you would like to see and check the distances. For more day trips from Lisbon, have a look at: 5 Fantastic Day Trips from Lisbon . I hope you enjoyed reading this article and I hope I could help you, at least a bit. I wish you a lot of fun! If you’re planning your trip to Costa da Caparica, let us know in a comment on how it was.